Our worldwide fresh water supply is not only dwindling...it is losing its purity. Many cities across the globe are in such a calamitous state that they are dependent upon recycled waste water to supplement the massive, daily needs of modern societies. Our worldwide sources of fresh water: glaciers, large fresh water lakes, rivers and aquifers...are DEPLETING and becoming more oxidized...polluted...less pure! NOT True! These are just the HARD FACTS! What Do you Want to KNOW about Alkaline Water? ASK Us! You MUST at Least Drink Filtered Water! 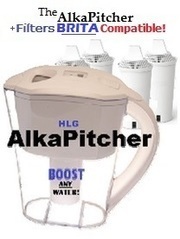 The AlkaPitcher Filters as well as Alkalizes and Ionizes Tap Water. Replacement Filters Compatible with BRITA Pitchers/Dispensers! See Water Conditions In Your Community! Always on the Go? 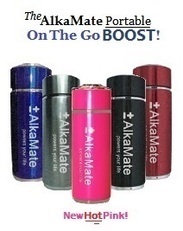 Try the Portable ﻿Alka﻿Mate! Increased Alkalinity! Ours ARE Just as Good or BETTER than Others at 3 Times the Cost! ...for DAILY, High Alkaline Water Production and OPTIMAL Water Consumption!